During the dark days of the London Blitz when the city was under constant bombardment from Nazi bombers during World War II, an unlikely hero emerged, the British fighter plane known as the Spitfire. Ever since, the aircraft has gained iconic status and is still beloved all these years later. 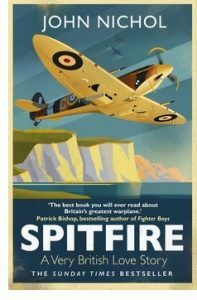 Now, in the wonderfully presented book, Spitfire: A Very British Love Story, author John Nichols explores the history of the great plane and its long lasting legacy. Spitfire: A Very British Love Story by John Nichols is available from Amazon and other fine booksellers everywhere. Lost Cowboy is powered by	WordPress 5.0.4 and delivered to you in 0.742 seconds using 45 queries.